a chess engine by Stefan Meyer-Kahlen (SMK). Shredder won an astonished number of tournaments and titles, beside various World Computer Chess Championships, World Microcomputer Chess Championships and World Chess Software Championships, the IPCCC, the International CSVN Tournament, the CSVN Programmers Tournament, and more. Shredder had its debut at the WMCCC 1995 in Paderborn, and soon after winning the first title at the WMCCC 1996 in Jakarta, Shredder went commercial, distributed by Millennium 2000 GmbH - since Shredder 3 along with the Millennium Chess System (MCS), since Shredder 5 also developed by SMK supporting the UCI protocol, which was co-designed and implemented by the same author. Therefore Shredder may use any UCI-compatible graphical user interface, in particular its own Shredder Classic GUI. The long-awaited Shredder 13 and its multiprocessor counterpart Deep Shredder 13 were released on October 30, 2016. Quote from Shredder Chess  : The Shredder chess programs by Stefan Meyer-Kahlen provide a game playing and analysis tool for everybody and are accepted as one of the best chess programs of the world. Since 1996 Shredder has won twenty titles. Since Shredder is written in C, it is available for various hardware platforms, such as PC, Macintosh, and PDAs, and various operating systems like Windows, Linux  and Mac OS  . Clever & Smart was an experimental triple-brain version of Shredder which played the IPCCC 1998. Deep Shredder, first released in 2001 based on Shredder 5 , is the multiprocessor version of Shredder. 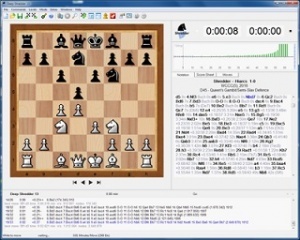 The most recent version, Deep Shredder 13  released on October 30, 2016 , is the further developed 2015 World Computer Chess Software Champion, which was a complete rewrite based on bitboards. Deep Shredder 13 has improved more than 300 Elo over Shredder 12 . 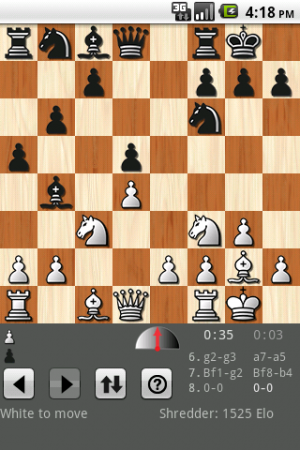 Shredder and Deep Shredder come with a clear and reliable graphical user interface which evolved from the Millennium Chess System - supporting the universal chess interface , also compatible with other UCI engines running under Windows, Linux or Mac OS. The Shredder GUI is favoured by many programmers playing over the board tournaments with their engines, for instance Johannes Zwanzger and his WCCC 1995 winner Jonny. Pocket Shredder is a version for Windows PDAs, such as iPAQ  . Shredder Mobile runs on most mobile phones with Java  . Shredder for Android runs on all phones and tablets with at least Android 4 as well as on all Kindle Fire phones and tables since the 2nd generation . Shredderbases are compact, proprietary endgame bitbases for up to 5 men with WDL information, suited to use inside the search . Shredder Classic 1.3 : ?